STRONGROOM is pleased to present SURVEYING LIBERTY, a site-responsive public installation by JENNIFER WILLIAMS installed outdoors at the corner of Broadway and Liberty Street in Newburgh, NY. 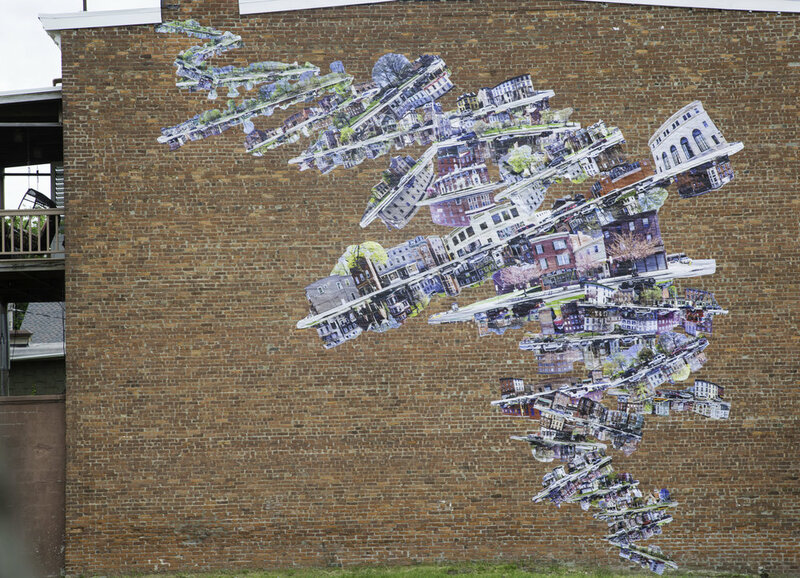 The large scale photo-collage will cover the empty wall in this vacant lot in the heart of downtown Newburgh, debuting during the Newburgh Illuminated festival, and remaining on view for the duration of the summer. Jennifer Williams’ large scale photo collages are site-responsive and activate transitory, passive, overlooked, and seemingly negative space, allowing the photographic subject to interact with the structural idiosyncrasies and social context within an exhibition space. For her Newburgh presentation she chose to focus on Liberty St., the longest through-line in our city, and most diverse in its architecture and spectrum of revitalization. 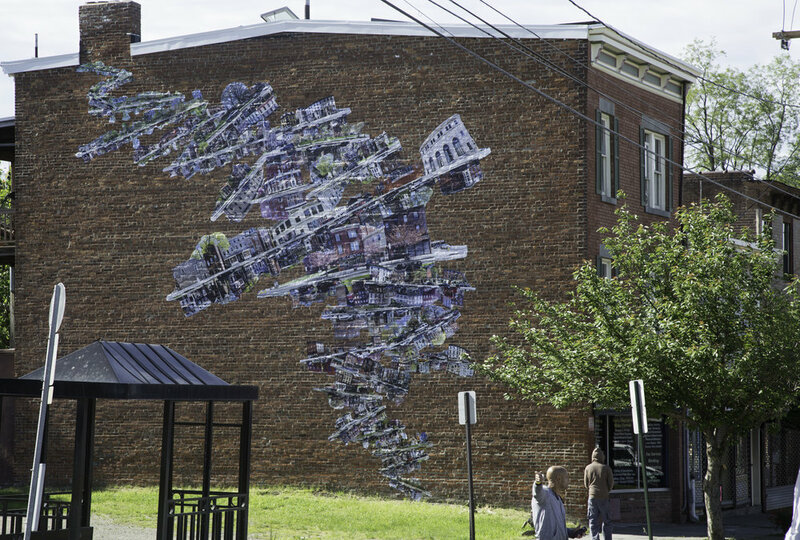 In depicting the entire length of Liberty Street, Jennifer both celebrates Newburgh’s history and architecture, while also raising questions about changing urban landscapes and the future of our city, including the evolving meaning of liberty in both Newburgh and the rest of the country. Jennifer Williams is based in New York City and studied at Cooper Union and Goldsmiths in London. She has had presentations at The Queens Museum, The San Jose Institute of Art, The University City Arts League in Philadelphia, The Hunterdon Art Museum in Clinton, NJ, Pittsburgh Center for the Arts, NARS Foundation, Brown University, UMass Amherst, the DUMBO Arts Festival, and Robert Mann Gallery in Manhattan. Most recently Jennifer installed a 10,000 square-foot commission on the campus of Virginia Tech and is also currently an artist in residence for the Queens Council on the Arts. STRONGROOM is a 501(c)(3) non-profit organization based in Newburgh, NY producing pop-up contemporary art exhibitions and related public programs, activating Newburgh’s empty spaces.